A more buoyant Woolworths and expansion from Aldi has seen Coles’ market share decline in 2016-17, for the first time in years to 30.9 per cent. “The nation’s second largest grocer is likely to invest strongly in 2017-18, with its market share expected to remain relatively stable next year,” according to Nathan Cloutman, IBISWorld Senior Industry Analyst. IBISWorld has revealed the state of play in Australian supermarkets, a $101 billion industry and employer of over 360,000 people across the nation. Total industry revenue for the 2016-17 year declined slightly due to the strong price competition between Coles and Woolworths. However, the industry is expected to recover and grow by 1 per cent in 2017-18, to a total of $101.1 billion. Woolworths’ refocus on its Australian food division has seen the company invest in reducing prices to better compete. “The company has gained market share for the first time in several years in 2016-17, with this expected to continue in 2017-18,” Cloutman said. Woolworths is projected to account for 36.8 per cent of industry in 2017-18, remaining the largest Australian supermarket company. Aldi’s expansion in Western Australia and South Australia is expected to boost the company’s market share to 8.6 per cent in 2017, ensuring it remains the industry’s third largest operator. An upgrade of its eastern seaboard stores and the introduction of a larger range of fresh food items is also part of the German retailers ongoing plan for growth in Australia. Individual operators under the Metcash network, including IGA, have collectively suffered declining revenue in 2016-17. 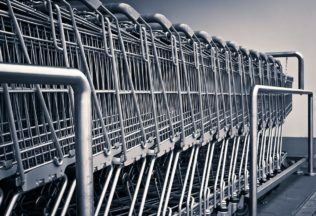 “The price war between Woolworths and Coles and the expansion of Aldi is putting pressure on smaller retailers,” Cloutman said. Metcash is forecasted to continue to struggle in 2017-18, with the company’s market share declining to 7.5 per cent. Online grocery sales are expected to grow an annualised 12.4 per cent over the next five years, with the entry of AmazonFresh making online sales an increasingly important facet of the supermarket and grocery industry. “Woolworths and Coles are constantly improving their online sales channels by expanding their click and collect options,” Cloutman said. American retailer Costco is also accelerating its move towards online sales, trialing an online delivery service for businesses in Melbourne. Australian’s spend significantly less time and money on online grocery shopping compared to the United Kingdom and United States, with online grocery sales expected to represent a small share of total grocery sales in 2017-18, at two per cent. Dairy producer Parmalat has launched a number of flavoured milk varieties in time for summer.